I can’t remember the last time I brought a lunchbox with me anywhere. 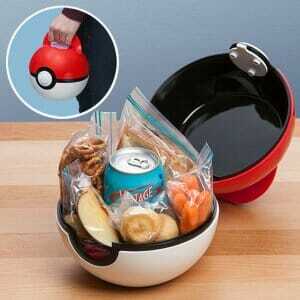 But this Pokeball lunch box sure makes me want to start packing up my meals and start eating on the go. Just look at this Pokemon lunch box it is basically the perfect lunch box. It’s round and fit’s everything nicely in it. It is packed to the rim in this picture, what more can one ask for! Okay it may not be the right lunch box for you at this time in your life. But it could make a great gift for your child or nephew/nieces. They can live the dream that you should have been living with this nifty creation. We all know Pokemon is not dead and will continue to thrive so this Pokeball lunch box can do no wrong.